Our products ship from several affilated U.S. manufacturing plants direct to you. This is the shopping cart section of our store. To return to the catalog section CLICK HERE. Shipping charges are based on the total order value. For a table of shipping charges CLICK HERE. The product photos are representative of the item category and not necessarily exact for the specific product size and grit. 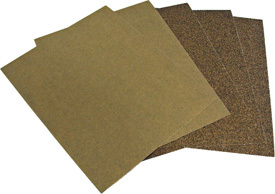 The top portion of the list below are 9" x 11" wet/dry silicon carbide paper sheets. Below that are listed 9" x 11" aluminum oxide cabinet paper mostly for wood sanding.